It’s Round Two for Salmond v Darling tonight. The good news is that those of us outside of Scotland will be able to watch it live on BBC2 (you can get 25/1 that either candidate mentions “STV Player” tonight). You can find our latest debate odds here. Salmond was 2/5 favourite to win the first contest, but Darling put in an unexpectedly aggressive showing and did a good job of pushing the First Minister into the corners before hammering him on the currency issue. Presumably, Salmond will have a better response worked out this time and the expectations bar is set much higher for Darling tonight, so we’ve still got Salmond as narrow favourite. We’ve also issued some Buzzword Bingo odds – just predict any word or phrase that either candidate will use at any stage of the debate. Will either of them decide to mention “Ice Bucket” at 5/4; that’s already been backed in from 2/1. 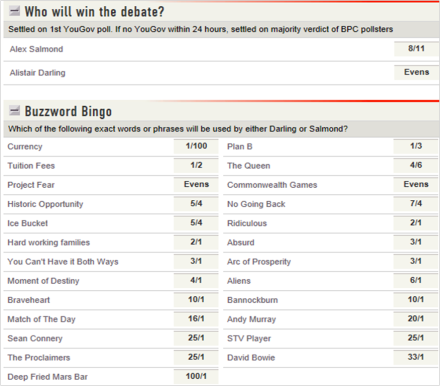 Perhaps Darling will want to poke a bit of fun at Salmond for his mention of attacks from outer space in the first debate; “Aliens” is 6/1. I note there is a campaign to get “The Proclaimers” to Number One in the charts on the week of the vote – it’s 25/1 that they get a name check. If anyone’s got any suggestions for other buzzwords, post them here and we’ll add the best ones to the betting. On the actual result of the referendum, we cut the odds of a YES vote from 5/1 to 9/2 yesterday following a week of non-stop support for a vote for separation. The NO camp will be pleased if Darling just gets through this one unscathed.